It is this massive increase in population that is the key reason why many of us living in the major cities are stuck in traffic, cannot get a seat on the train, are experiencing crowded hospitals and schools, and cannot afford a home. The population influx has simply overwhelmed our cities’ infrastructure and services. And the plan from all sides of politics – the Coalition, Labor and the Greens – is to continue the policy of high immigration without commensurate investment to cope with the influx. For a major commodity exporter like Australia, which pays its way in the world by selling-off its fixed endowment of resources, ongoing high immigration is self-defeating from an economic standpoint. That is, continually adding more people to the population year after year means less resources per capita. It also means that Australia must sell-off its fixed assets quicker just to maintain a constant standard of living (other things equal). The net result of this “Big Australia” policy is that living standards are being eroded as the capacity of the economy and infrastructure to absorb all of the extra people is overwhelmed, and the country’s natural resources base is diluted among more people. Despite these inconvenient truths, there are still many commentators that champion Australia’s word-beating immigration program. First, it was the sleight of hand by John Howard that originally mislead the Australian people on immigration. Howard effectively performed a ‘bait-and-switch’ on the Australian people whereby he slammed the door shut on the relatively small number of refugees arriving into Australia by boat all the while stealthily shoving open the door to economic migrants arriving here by plane. Howard never explicitly mentioned that he was in favour of high immigration because he knew the electorate would be against it. Instead, he scapegoated refugees to give the impression that he was stemming the migrant inflow while proceeding in secret with his ‘Big Australia’ plan. Unfortunately, rather than being honest with the electorate, the Rudd/Gillard Governments and the Abbott/Turnbull Governments continued the subterfuge. There has never been any community consultation, any national discussion, nor any mandate to proceed with turbo-charged levels of immigration. This comes despite an Essential Research opinion poll released in May revealing that the overwhelming majority of Australians (59%) believed “the level of immigration into Australia over the last ten years has been too high”, more than double the 28% of Australians that disagreed with that statement. Second, the claim that the Australian Government has control over “who comes to this country and the circumstances in which they come” is questionable. Skills shortages “remain low by historical standards”, according to the Department of Employment, whereas there is a huge surplus of underutilised labour, thus undermining the rationale behind the large-scale importation of foreign workers. The system surrounding so-called skilled and student visas has been corrupted, with widespread rorting and fraud revealed by the recent joint ABC-Fairfax investigation (see Australia’s hidden people smuggling scandal), leading to claims the system has been overtaken by “crooks and criminals”. When combined with the Turnbull Government’s policy allowing 6 year-olds and their guardians visa entry into Australia’s primary schools (and conveniently allowing them to purchase established property), along with the proposal to allow migrants to bring into Australia their elderly parents (thus further ageing the population and straining Australia’s healthcare system and infrastructure), it is clear that Australia’s purported “skills-based” immigration system is a farce. Worse, because of this dysfunctional policy, Australia is on track to nearly double its population by 2050 to more than 40 million people, despite virtually no discussion nor mandate for this dramatic change, nor any plan on how to cope with this growth. It would be nice if politicians examined the facts, and gauged the community’s views, before pursuing the current high population (immigration) growth strategy. 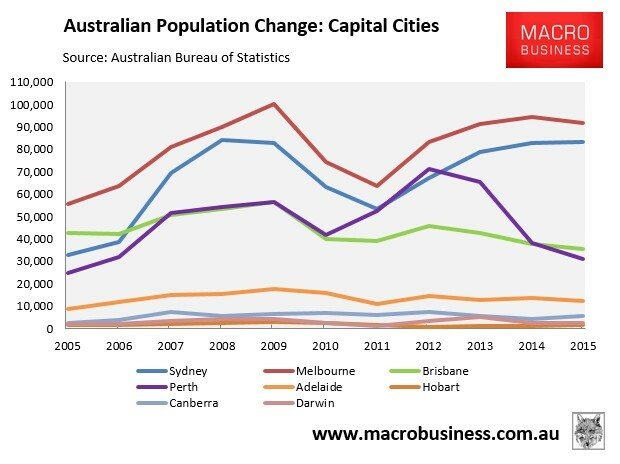 This way, Australia might not have been left with an “infrastructure emergency”, housing affordability problems on a grand scale, and falling livability. 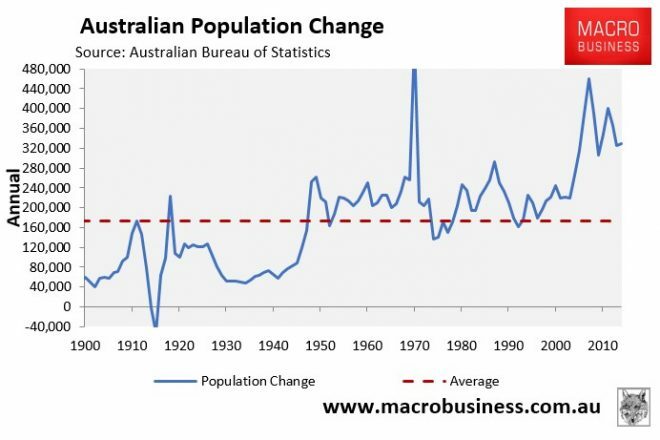 Australia desperately needs a frank and honest national conversation about population policy, which focuses on whether or not large-scale immigration is benefiting the living standards of the existing population. Not the current ‘smoke and mirrors’ approach that conflates immigration with refugees, or the divisive “Hansonites vs progressives”. Several commentators are calling on Labor to co-operate with the government and tackle the "budget emergency". As Ross Gittins pointed out (Comment, 24/8), there is no emergency. The deficit is an illusion caused by lumping the cost of capital works on top of current expenditure. What the country is facing is a huge infrastructure deficit, as we continue to bring in 200,000 migrants a year to add to the 130,000 babies born here, without building the schools, hospitals, roads and public transport systems this growing population requires. Emma Alberici interviewed John Howard last night on Lateline. It is worth watching for how John Howard talks about Pauline Hanson following her maiden senate speech and also interesting to note that Emma Alberici seems to be unaware that immigration to Australia is very high at present. John Howard let her know adroitly without sounding any alarm bells about it.